NASCAR usually runs on relatively tidy paved ovals, but not tonight. 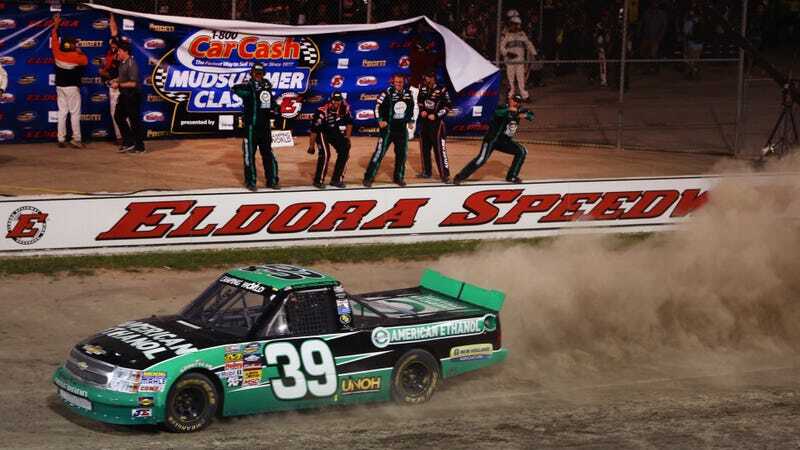 It’s time for the Race I Will Always Call The Mudsummer Classic To Annoy Baseball Hosers where the NASCAR Camping World Truck Series runs on Eldora Speedway’s dirt oval. 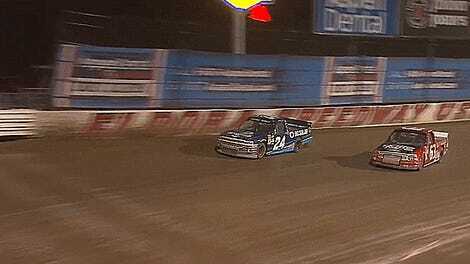 It’s a whole race of NAS-trucks sideways on dirt, and it is wonderful. There’s a certain spectacle when it comes to loud V8 trucks throwing dirt clods in the air. Even if you don’t usually pay attention to NASCAR’s third-tier national series, or NASCAR at all, Eldora is synonymous with mayhem and worth the watch. Our own Raphael Orlove got to drive a McLaren on Eldora once, and found out that it’s harder to keep gobs of power under control on slippery dirt than it looks. Watching an entire fleet of rowdy V8 race trucks that have at least 650 horsepower on tap try not to wreck each other out is incredible. Each qualifying race lasts for ten laps, where the starting order for each qualifying race is filled out based on the speeds of the rest of the field (sixth fastest goes in the first qualifying race, seventh goes into the second qualifying race, eighth goes in the third, and so on). The top five trucks in each race will go on to the main race. A last-chance qualifying race will happen afterwards among the trucks that are left, and the top two will advance to the main race. Thirty-two trucks in total will battle it out for ultimate dirt glory, with places 28-31 being determined by the highest-ranking trucks in owner points, and the 32nd starting spot goes to the most recent series champion if there is one, or is the next highest truck in owner points if there is not. 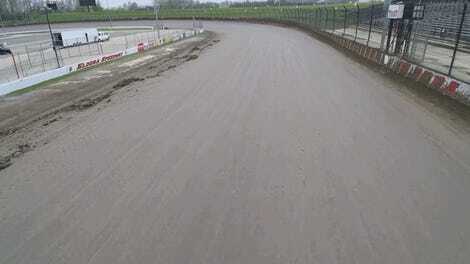 That 75-mile, 150-lap race now called the “Eldora Dirt Derby” is tonight. Yes, on a Wednesday, hence the unusual heads-up. TV coverage of the dirtiest show on NASCAR’s schedule starts at 9:00 p.m. ET on Fox Business for the main show. Not Fox Sports, not Fox proper, but the Fox Business channel. Really. If you want to tune in for the qualifying races beforehand, you can find them from 7:30-9:30 p.m. ET on Fox Sports 2.